Living in Michigan doesn’t present a lot of surfing opportunities. 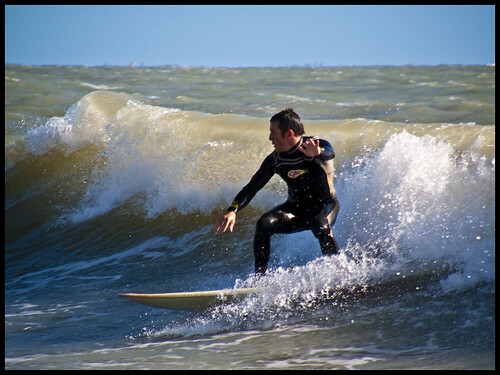 Although I have traveled to numerous places where it is part of the culture, I have never myself been surfing. But the sport delivers a great workout for the legs, core, shoulders and other muscle groups. A company called SurfSET Fitness invented this gnarly RipSurfer X that combines cardio, strength, high intensity interval training and paddling conditioning into what it calls “The only total body surf-style trainer.” It’s the shape and size of a surfboard that is made to be just as unstable as it would be in the water, forcing your muscles to work harder to first balance and then perform the exercise. I have to admit, I am not the most graceful at times, and adding water to the mix may not be in my best interest. I have tried water skiing, snorkeling and tubing, nothing fancy; I actually prefer to be the lookout inside of the boat. So I have always thought of surfing as something I would like to do but realistically probably won’t. You can purchase the RipSurfer X for a workout studio or a compact machine for home workouts. The machine is on back order and the website doesn’t have a price listed currently. I signed up for an email once the machines become available to see what the cost is. Like I said, this is a workout that will require dedication to build strength. I really wish there was a gym around mid-Michigan, where I live, or in Michigan at all that had a RipSurfer X machine to try out! If you had access to try the RipSurfer X, would you?